balsamic, strawberry & fresh sheep’s ricotta sandwich! You know by now that I love ricotta, especially sheep’s ricotta! I buy my sheep ricotta at the Southern market in Brussels, on sunday, at an Italian food shop. It is near the South station, ( Zuidstation ) in Dutch. I buy it fresh in 500 gr containers. Each one cost : 3.50 Euros. Ricotta is originally no real cheese. It is a byproduct of cheese. It is made of the whey left behind. Ricotta is made from the whey that is cooked twice. So, sheep ‘s ricotta is made from the sheep’s whey that is cooked twice. Ricotta means: what is cooked twice. There is cow’s ricotta & there is sheep’s ricotta. You can find the cow’s ricotta in almost every supermarket in town, like the Delhaize, the GB,… For 500 gr, you will pay about 1.20 Euros. As you know by now, I prefer the sheep’s ricotta. It has more flavour & it is a lot more expensive. How can you use ricotta? Ricotta is lovely spread on home-made or sourdough bread & to top it with fresh fruit or honey. 1. Take your slice of bread. 2. Smear it with minarine or butter. 3. Smear a thick layer of the sheep’s ricotta, evenly onto the bread. 4. Arrange your slices of the strawberries on top. 5. Take your coffee spoon of the best Balsamic vinegar & drizzle it over your strawberries & the ricotta! Enjoy!! Previous Post Quiche Lorraine à la Sophie! MMMMMM…Sophie!! I love it!! easy & fresh flavours!! OOOH Sophie, this sandwich looks great!! Yum! Simple & sophisticated! I'd eat this anyday … especially now that we're seeing some decent strawberries start to come around. Thks for another great idea Sophie! What a lovely sandwich – it looks delicious. Incredible idea. Lots of flavor in a simple sandwich. Can’t wait to try one for myself! That looks great! Love ricotta too :)Sometimes I just mix berries with ricotta and a bit of sugar.I also like it with salt and cucumbers and a bit of olive oil. Sophie,I love your simple recipes so much! I haven’t seen sheep’s ricotta anywhere (although I think I would love it) so I’m going to try this with cow’s milk ricotta. This recipe will be perfect with the fresh strawberries that will be coming out soon. Thanks! Oh Sophie this is wonderful. The strawberries just make it sing Spring! This would be great for breakfast! I am going to have to search out sheep’s milk ricotta! I have only had and made cow’s milk ricotta, but if you say it has more flavor, I must try it! Thanks for the tip! this looks lovely sophie – i can’t wait until british strawberries are in season so i can try something similar. Talk about the breakfast of champions! Great picture too. Fabulous, I love a ricotta sandwich. We make ricotta sandwiches with raw courgette and lemon zest in the summer. How lovely to have a sweet variation to use up the other half of the cheese! Ricotta, strawberries, balsamic–Sounds so great! I love your picture with the bite taken out of the sandwich 🙂 It looks delicious – I’m a big ricotta fan too, although I’ve never tried sheep’s ricotta, so I’ll have to look for it! That sounds lovely, Sophie. Simple but delicious. Thanks for all the information about ricotta! 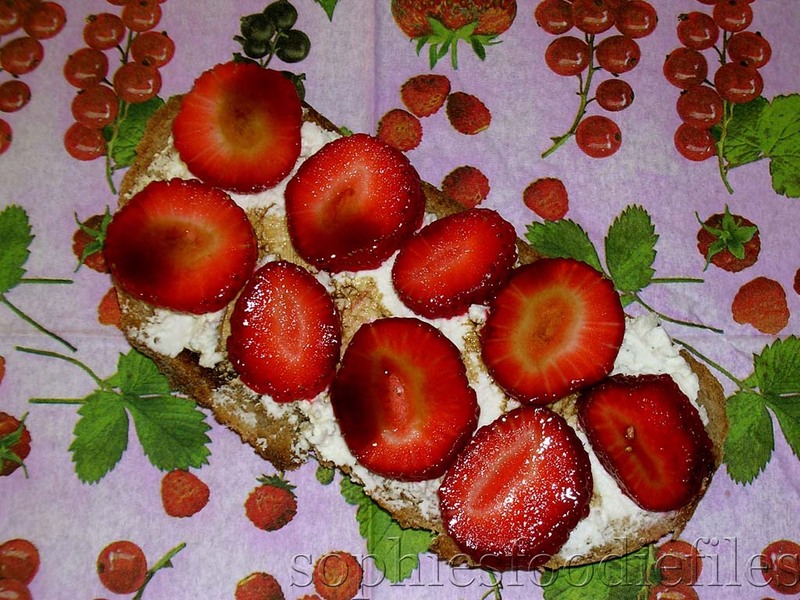 Your sandwich looks very good, I love the strawberries and ricotta! Ohh my gosh that looks good, really yummy! I am thinking of coming to Belgium when we go to Europe in June, I am so dim, are there fun things to do and see there? omg that looks amazing! I love ricotta too… I could eat it by the spoonful. This sounds like such a delicious snack. Strawberries and Ricotta together, I’m going to try that. Wow, that sounds so good! I love ricotta. Like you, I think I could eat it every day. I made this tomato-ricotta tart this weekend. Will have to post it soon! Oh… interesting about ricotta, I didn’t know it’s not a real cheese. How great is this? And, I just bought a fantastic balsamic syrup at the Farmers’ Market. Lucky me, lunch tomorrow. I love sheep’s cheese best in every category. I’m not sure I”ve had sheep’s ricotta, but I’ll bet it’s delicious. We eat open face sandwiches all the time, sometimes with apples and pears, but strawberries and ricotta are a perfect pairing. This looks so good Sophie. I love to eat ricotta like this as opposed to baking it into pasta. I think it loses flavor when it is cooked. This is right up my alley! Me encanta la ricota y con fresas,es una combinacion , se ve delicioso. I love you Spanish comment . Very good !!! Hola Sophie! Thanks for commenting in my blog :D. You have a lovely one here too! But, Cheese is not among my favourites… maybe in my next life ;DHowever, I must admit it looks good. Now I have to add sheep’s milk ricotto to my ever growing “must try” list. Great idea with the stawberries and balsamic. I love ricotta cheese in pasta but I’ve never had it in toast. This is definitely on m ylist to try! Saw your blog around and wanted to say hi! I love your “primer” on ricotta. If this is your favorite sandwich, then I am sure I will love it too! Thank you for the recipe! Sophie this looks so good and fresh!!! Loving the recipe! 🙂 Thanks for sharing! That sounds and looks AMAZING! I love strawberrys and anthing creamy (sour cream is good too). I have never had sheeps milk ricotta (though I am pretty sure I would love it). I love ricotta too! I like to mix it with spinach and stuff cannelloni with it or it makes great cheesecakes!The strawberry sandwich looks fantastic, so simple but I’m sure it was delicious. I found this post on ricotta really interesting, and I’d like to experiment with it more. Unfortunately, I’ve never been able to find sheep’s ricotta where I live, which is too bad since your recipe sounds like a great breakfast or midday snack! Thanks for sharing this, Sophie! I love ricotta, I love strawberries, so I know I would enjoy this! I love ricotta although I’ve never had a sheep’s milk version. This is simply lovely and delicious! Ricotta and strawberries, I love it!! Ricotta and strawberries are a great combination. Hi Sophie, nice to find your blog too! I have never used ricotta and always want to try to make something out of it but never know what to try! 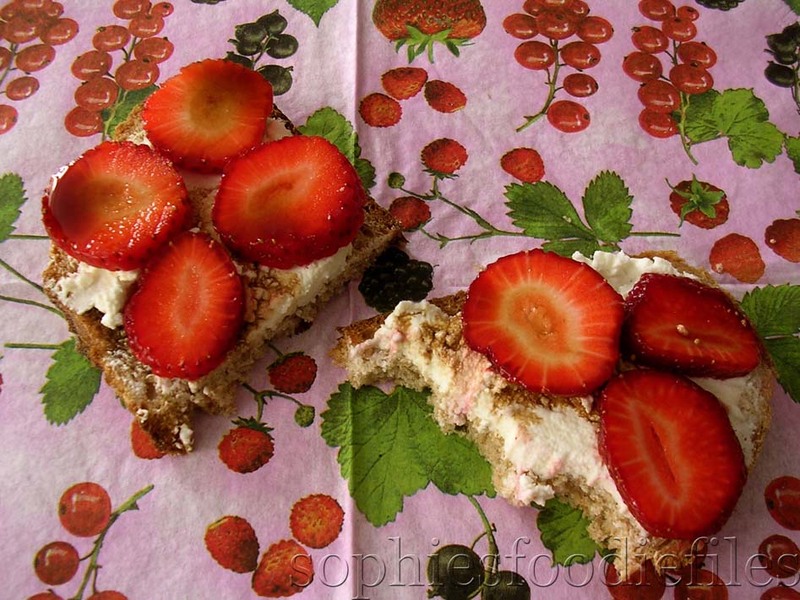 I love your idea of ricotta with strawberry, gotta try it immediately after Easter. Mmm. I love ricotta though, y’know, I’m not actually sure if I’ve had sheep’s ricotta – I’m guessing that, by default, what I’ve had was made from cow’s milk. I’ll have to look out for the sheep version. This is great-just in time for strawberry season here! I love ricotta and strawberries and always need some new recipe ideas for using up the berries when I get carried away at the pick-you-own farm. OMG i love ricotta! Going to check out your smoked salmon wraps…. MMMMM….Sophie! I made these sandwiches yesterday & I loved the flavours so much! !Thanks so much!! Yum! Just write about me & my blog & refer to the actual blog post & that it is wriiten by me! Hello.This article was extremely motivating, especially because I was looking for thoughts on this topic last Sunday. Good blog! I really love how it is easy on my eyes and the data are well written. I am wondering how I might be notified when a new post has been made. I’ve subscribed to your RSS which must do the trick! Have a nice day! “A crime which is the crime of many none avenge.” by Lucan. Some really nice and utilitarian information on this web site My favourite ricotta sandwich Sophies Foodie Files likewise I think the style has excellent features. Howdy I am so happy I found your blog, I really found you by accident, while I was browsing on Yahoo for something else, Anyhow I am here now and would just like to say cheers for a tremendous post and a all round interesting blog (I also love the theme/design), I don’t have time to read it all at the moment but I have bookmarked it and also added in your RSS feeds, so when I have time I will be back to read a lot more, Please do keep up the superb job. I think this internet site contains some really excellent information for everyone. I have recently started a web site, the information you offer on this site has helped me greatly. Thank you for all of your time & work. “Men must be taught as if you taught them not, And things unknown proposed as things forgot.” by Alexander Pope. You can certainly see your expertise in the work you write. The sector hopes for more passionate writers like you who aren’t afraid to mention how they believe. At all times go after your heart. “Experience is a good school, but the fees are high.” by Heinrich Heine. Thanks for all your efforts that you have put in this. Very interesting info. “If you tell the truth, you don’t have to remember anything.” by Mark Twain. I really like your writing style, wonderful information, thank you for posting :D. “Silence is more musical than any song.” by Christina G. Rossetti. Just wanna comment that you have a very decent web site , I like the pattern it really stands out. Greetings from California! I’m bored at work so I decided to browse your website on my iphone during lunch break. I love the knowledge you provide here and can’t wait to take a look when I get home. I’m amazed at how quick your blog loaded on my cell phone .. I’m not even using WIFI, just 3G .. Anyways, wonderful blog! Thank you for pretty impressive post. I’ll be subscribing to your feed and I hope you post again soon. Hmm it seems like your blog ate my first comment (it was extremely long) so I guess I’ll just sum it up what I wrote and say, I’m thoroughly enjoying your blog. I too am an aspiring blog blogger but I’m still new to the whole thing. Do you have any points for rookie blog writers? I’d genuinely appreciate it.